After writing my last post, I noticed that owls are the latest fad in jewelry & home decor. 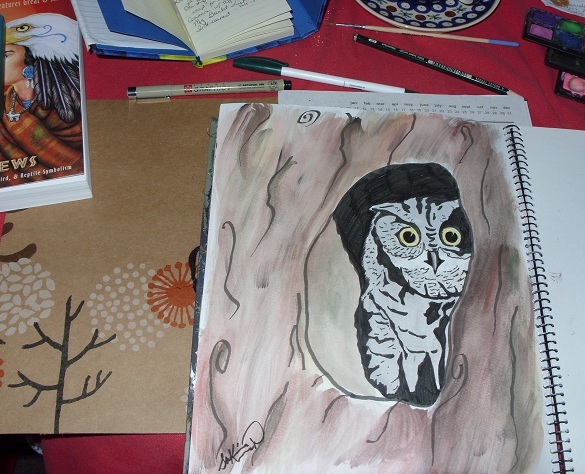 For example, I received 2 owl necklaces, an owl figurine, & owl notecards for gifts this past year. Every time something new becomes trendy with mainstream America, I ask myself, “Why?” Why designer handbags? Why expensive little beads for bracelets? Why painful stiletto shoes that cost a fortune? Why owls? Owls have resonated with people for thousands of years. To many earth-centered cultures, Owl is a symbol of wisdom, magic, omens, prophetic vision, the moon, & the Divine feminine. Owl was Athena’s animal, a symbol of higher wisdom. To the Pawnee, it symbolized protection & to the early Welsh, fertility. Christian Gnostics associate Owl with Lilith, Adam’s first wife. She refused to submit to Adam & left him (& the garden) of her own free will. Owl is a symbol of her strength. I find it ironic that the Gnostic story states both Lilith & Adam were made of the earth while Genesis states Eve came from Adam’s rib (& doesn’t even refer to Lilith at all). It puts Eve (& all women) “beneath” men in a subservient way. Interesting…. I must read more about this but don’t know enough about it to comment further here. Because of Owl’s acute vision & hearing, it can see & hear what others try to hide, making their secrets transparent. The message being: keep silent & stay alert; all will be revealed. I find it intriguing that so many cultures throughout history attach spiritual significance to animals, reinforcing, for me, the importance of honoring all forms of life on this planet. Seeing an owl in the wild has been on my “Bucket List” for years. It’s these smaller obtainable dreams that make life worth living & I do everything I can to make them come true. A local park offered an Owl Walk last Friday night so we took advantage of the mild January evening & set off for an adventure. It was the perfect evening, clouds covered the moon & stars so the night was totally dark… & totally silent (even with little children in the group!). With our voices mute, we heard Mother Nature talking to us through the babbling stream that ran along the trail & the whispering wind in the branches of maples & firs not yet heavy with snow. I closed my eyes & imagined a time before street lights & headlights. A time before the hum of electricity drowned out the voice of nature. Our guide called out to the screech owls who might be hiding in the darkness. It sounded like the whinnying of a horse but it worked! A screech owl responded to our call. The guide called again. The owl called back, each time circling a bit closer, closer… until the guide clicked on his flashlight. The surprised owl sat on a low-lying branch just feet from us. A bit disappointed that we weren’t a potential mate (I can only imagine), he pushed off the branch, spread his silent wings, & disappeared into the night. No one spoke. I could only squeeze my boyfriend’s hand in amazement. Magic. 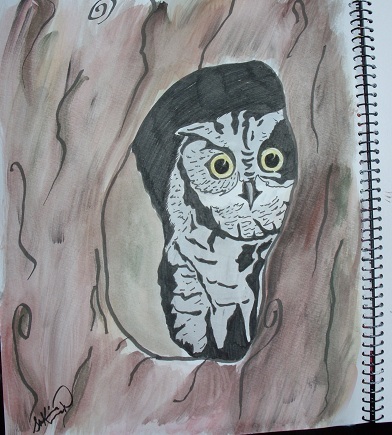 The watercolor & ink sketch below is in homage to the owls, trying to live among humans in habitats that are ever-shrinking. I hope one day soon, we see how much responsibility goes along with being human & begin to respect & love our earthly home as well as our extended animal & plant family. In a few short weeks, I’ll be facilitating a workshop for women who want to continue exploring their spiritual journey in the context of woman-honoring cultures throughout history. We’ll travel to various countries across several continents, studying matriarchal societies & the concept of the divine feminine. I say “continue exploring” because many of these women have taken my previous workshops & want to continue their exploration in the company of other intelligent, warm, funny, spiritual women ranging from their teens to their seventies! Leading this workshop is a bit like being a cruise ship captain, planning activities & excursions so each passenger can find the trip worthwhile & fun along the way. Instead of shuffleboard & a swimming pool, I’m providing religion, the arts, politics, & history. What does one pack for a spiritual journey? Chants/songs, rituals, study, writings, personal experience, meditation, drumming, artwork, storytelling, dance, visualization, & service to others are the items which make the journey worthwhile. 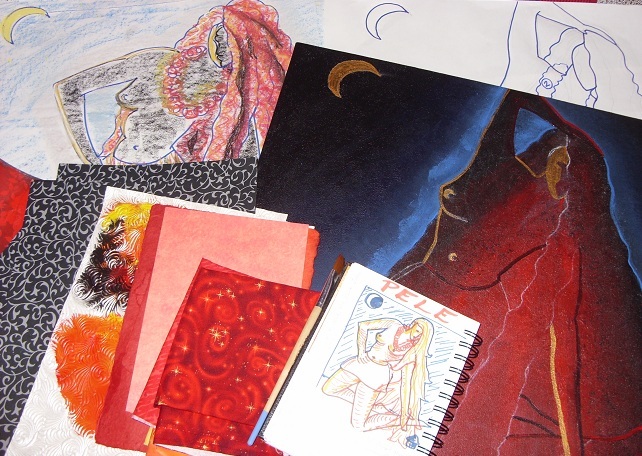 Each participant will find that certain items resonate with her while others aren’t as important for the path she is traveling. It’s ok. Take what is needed & leave the rest. 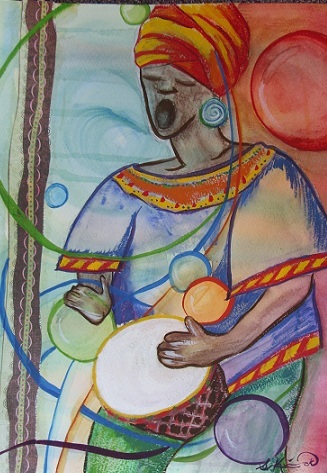 My quick study of a jubilant African drummer in gouache & watercolor inspires me to create a body of artwork based on the spiritual items described above. Soon, I’ll share them with you. Blessings to you as you travel your own path. Drumming is one way to explore & celebrate spirituality. I had an epiphany while walking the dogs last night. (Keep in mind that my epiphanies sometimes occur only after I’ve figuratively beat my head against a wall not once, not twice, but three or more times!) I realized that I’m trying to change things that aren’t mine to change. You’ve probably felt this way at some point– helplessly watching a friend battle addiction, a sister suffer in a bad relationship, or a co-worker compromise their principles for the safety of a paycheck. Perhaps, your concerns are even bigger– animal cruelty, global warming, or the state of our nation’s educational system. When we care passionately, we want to help. When we care passionately, we want to fix it & make it all better. When we care passionately, we sometimes have to let go. This makes sense to our brain but takes longer for our heart & soul to admit. “Yes, I know that but I can’t give up.” The bottom line is that we don’t want to give up because we see it as a sign of failure. Giving ourselves permission to let go of things beyond our control isn’t failure; it’s an opportunity to redirect our time, energy, & emotions in a more productive & positive way. Maybe it’s time for some soul-searching. Am I putting my energy where it can do the most good? Should I take that energy & put it elsewhere? Approach your Self with love, compassion, & empathy. It’s not failure to let go of what wasn’t yours to hold in the first place. Peace. My limited research into Jungian psychology revealed too many conflicting opinions to be of much value so suffice it to say, I’m ending this exercise knowing that “shadow” isn’t a term I want to use to describe my Self. It’s impossible to identify most character traits as exclusively strengths or weaknesses for strengths can be weaknesses and weaknesses can be strengths depending on the circumstances. For example, look at how independence can give someone the courage to act on a dream or alienate someone when it masks vulnerability. 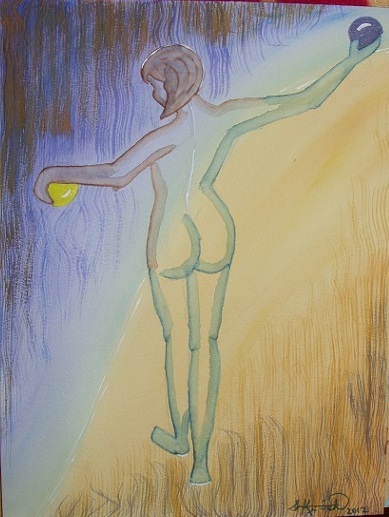 For that reason, I created this watercolor of myself, facing the dark with feet planted firmly in the light, embracing both the light & the shadow equally in my hands. Embracing all qualities that make me uniquely ME. Jung can keep his labels. The only label I’ll use for my Self is “Pure Susan”. Happy New Year everyone! Instead of the typical new year’s resolution, I’m choosing to clarify my artistic vision. Over the holidays, I spent time in malls (yuck!) & traffic (double yuck!! ), noticing that our world is dull with everything from cars to clothing to home decor items available in boring black, white, greys, or neutrals. I can’t even say the word “beige” without wrinkling my nose! Our economy is depressed & apparently so is our culture. Where are ruby red, lime green, & sunny yellow? Where are positive images & inspiring design? For 2012, I want to reintroduce words like magic, mystery, wonder, whimsy, inspiration, & imagination. Creativity thrives in an environment built on these terms. My first piece is called “Between the Worlds”, a small painting inspired by Marion Zimmer Bradley’s book Mists of Avalon. I adore this book because it takes the Arthurian legend & retells it from the female perspective, celebrating feminine virtues such as intuition, wisdom, & strength that comes from within. It’s obvious why it was an award-winning bestseller & the inspiration for future books & film. My painting in cool tints of blue, purple, green, iridescent white, & silver shows Morgaine traveling from the mist-shrouded Avalon to our reality, represented by Stonehenge. I love it’s sense of mystery & mysticism. 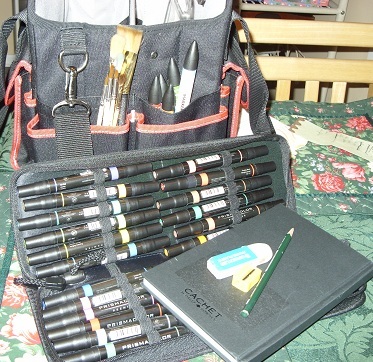 So, I’m off on a new adventure… reclaiming attributes that inspire great art & design, making them my own. Between the Worlds, where magic & mystery still exist.